Not only is Kashink one of only a few girls active in the street art / graffiti movement, but she is also a very atypical personality. 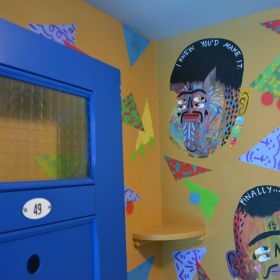 She often wears a moustache, paints immense multi-formed figures with numerous eyes, or mexican death's heads, using a very colourful and graphic style; a long way from the more usual influences of girly graffiti. Inspired by her slavic and hispanic origins, pop art and narrative illustration, her work can be seen as much in the street as in art galleries. She is increasingly invited to present her work abroad (Canada, United States, Europe) and paint on the walls of european cities such as London, Vienna, Ibiza, Bristol, Madrid, Berlin and her hometown, Paris. Kashink defends a very politically engaged art: painting in the street allows her to present real wide reaching messages. The themes which drive and inspire her include: sexual equality, homosexuality, religion, finiteness... She produces wall paintings for equal rights (act up) and volunteers for associations such as "La voix des enfants" and Emmaüs. For her, street-art must remain a militant act.